I read one of Benjamin Alire Sáenz’s other books, Aristotle and Dante Discover the Secrets of the Universe, a few years ago and it blew my mind. It was incredible in every possible way. I loved it and I will always recommend it. So I was beyond pumped when I heard about The Inexplicable Logic of My Life. It sounded amazing, it had diverse characters, it was written by the same person who wrote Ari and Dante. I knew it would be awesome, I knew I would love it. However, that’s not the case. I wanted to love this book so much but it just didn’t do it for me like I thought it would. 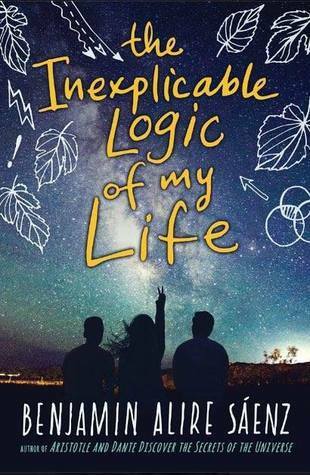 I was expecting to fall in love and cry and everything that Ari and Dante did for me but The Inexplicable Logic of My Life is pretty basic. It’s okay. I liked it for the most part but I didn’t love it. I might recommend it to some people but I wouldn’t go out of my way to tell people about it. My main problem with this book is the stereotypes and assumptions. There was a lot of them and it didn’t sit well with me. It felt cheap and thoughtless at times. Things like “one thing about Sam was that she didn’t throw like a girl” just wasn’t okay. I would never have expected things like that in this book so it really surprised me. One thing I thought was really cool about this book was that the main character is adopted by a gay Mexican man. The main character is white but he identifies with his father’s culture because that’s how he was raised. I hadn’t seen that before in a book (or movie or tv show or anything, to be honest) and I thought that was pretty cool and maybe a lot of people could relate to that and feel a bit of representation. I did like the main character, Sal, a lot. He was very different from most YA male characters and I thought it was really amazing. I loved his dad the most though. He was such an incredible character. If you’re looking for a book with great family dynamics, The Inexplicable Logic of My Life has it. I wasn’t a big fan of Sam, Sal’s best friend. She was kind of hurtful to Sal at times and I felt like she was ignorant to a lot of things and was very self-righteous. But she did have really good character development so that was nice. The plot was kind of… not there. This is a pretty big book, 464 pages, but nothing really happened. If I had to describe the plot of this book to someone, I don’t think I could. There was an awful lot of nothing happening in this book. I did really appreciate how there wasn’t any romance in The Inexplicable Logic of My Life. Most YA contemporaries are romance driven and it can be difficult to find something without romance. Overall, The Inexplicable Logic of My Life was okay. There was a good deal of things I didn’t like but if my expectations weren’t so high, I might not have been so disappointed. If you’re looking for a book exclusively for diversity or you don’t want any romance, you should check this book out. Or if you’re not that critical of a reader, you might enjoy this book a lot more than I did. But for me personally, The Inexplicable Logic of My Life didn’t do it for me. I think it could have been a lot better and I can’t ignore the thoughtlessness of some of the things in this book.